Baseball Catcher Basics can apply to a vast amount of subjects and skills, but today we’re going to learn the basic philosophy and thought content of calling a simple game behind the plate. Obviously these tips are basic and don’t scratch the surface of a major league catcher’s preparation, but as with all other baseball skills … begin with the basics and build from there. Catchers share many common characteristics, being tougher than nails, leader of the infield defense, fearless protector of home plate against runners and a deterrent against base stealing through their arm strength. But have you ever noticed, in the MLB, catchers are most likely the oldest player in the infield? You’d think the younger, stronger players would be assigned to the most difficult position in baseball, not an old timer. However, the old timer has gained experience and knowledge through the years that allow him to make his pitching staff better than they really are. It’s a proven fact … a good catcher makes a better pitcher … a good catcher makes a good pitcher a great pitcher. The catcher is the pitcher’s source of information on how to pitch a batter and this begins anew with every 0-0 count, even if it’s the third time through the lineup. It’s very important to success for the pitcher to pitch ahead in the count as it opens many different options of how to attack a hitter. Therefore, the catcher must be aware of the type of pitch which the pitcher is throwing mainly for strikes and start the batter out with that pitch, which 70% of the time in the pros and nearly 99% of the time in amateur baseball, is the fastball. You counter the batter’s anticipation of the fastball by varying location. If the pitcher falls behind in the count by throwing a ball it’s important the catcher get the count back to an even 1-1 count. Again, he must call the pitch which the pitcher has the most control, but instead of setting up on the outside corner of the plate, he may bring it in a couple of inches to catch more of the plate. Now that you have a 1-1 count, you have a slight advantage over the batter. This means you may want to call another type of pitch or move back to the outside of the plate an 1” or 2” off the plate in order to entice the batter to swing at a ball. A word of advice… attaining a strike and going to a 1-2 count has been calculated to reduce the batter’s average by 150 points. In other words a 300% hitter suddenly becomes a 150% hitter. However, going to a 2-1 count, gives the batter an advantage over the pitcher. He can be more selective at what he swings at which can result in hard hit balls, some for hits, some for tough outs. There are a couple of things a catcher must consider on a 2-2 count. If he calls a curveball or a change up, chances increase that the ball will end up in the dirt. 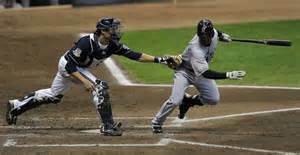 The catcher must honestly analyze his ability to block the ball and if there’s fear involved, don’t call the pitch. There is also the train of thought that the pitcher should throw his best pitch, normally a fastball, on a 2-2 count. That way if the count should go to 3-2, he has another chance to obtain the out by throwing his fastball, best pitch, again. Baseball Catcher Basics: Calling a game is not only affected by the pitch count, but also by the base runners and the type of hitter at the plate. (a.) With a runner on first base and a left-handed hitter at the plate, it’s important to pitch this hitter on the outside portion of the plate. If you throw inside, especially low and inside, or throw change ups, the chance the left handed hitter will be able to pull the ball through the vacated right side of the infield increases a 100 fold. It’s difficult for a left handed batter to pull a fastball away, and if he does it normally results in a weak blooper. In the situation of a right handed batter, the pitcher must throw fastballs inside, in order to make it difficult to hit the ball to the opposite field. I know there are counter-measures the hitter can use, but remember … these are basic rules. With a runner on second and less than 2 outs, the goal should be to not allow the batter to hit the ball to the right side of the infield, which will move the runner to third or allow him to score if the ball gets through to the outfield. Utilize the strategies from above, pitch outside to a left handed hitter, inside to a right handed batter. I might note here, there is nothing that says you can’t pitch inside to the leftie or outside to the righty … just make sure the pitch is located well off the plate. You’ve shown him the pitch, but there was no way he could hit. With a runner on third base and less than 2 outs, you want to entice the hitter to hit the ball to left side of the infield, which will prevent the run from scoring as long as the ball stays in the infield. Change ups and off speed pitches are effective here as they produce ground balls and weak pop ups. If you’ve never faced this team before and have no idea what they are capable of … simply close your eyes and hope for the best. Just kidding. 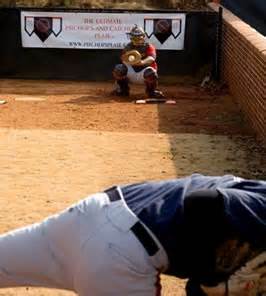 This is when you “Pitch to the Line-Up” which every good catcher should have memorized. You know your pitcher and his ability, just match that against the line-up. Hitters 1,2,8 & 9 can be pitched more or less the same way. You go straight at them attacking with the pitchers best pitch. The number 3 hitter is usually the best hitter on the team, pitch him carefully. Hitters 4 & 5 are normally power hitters who will like to try and pull the ball. Attack these hitters with breaking, off speed and hard stuff Away. Always away. The number 6 hitter is a combination of 1 & 2, but can have the power of 4 & 5. 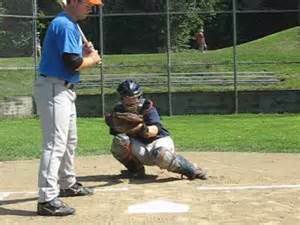 This lesson is of course not all inclusive, but it lays out an excellent elementary method for a catcher to learn how to call a game behind the plate. Obviously, things will not always work out as planned, but staying with the basics and working the percentages will put the odds in your favor and that’s a huge advantage.